When I insist that Maryland is a "Southern" state, my Georgia-born girlfriend only smiles and gives me that patronizing "poor, deluded man" look. But, though it may not be considered so in Georgia or Alabama, Maryland is a "southern" state by virtue of being below the Mason-Dixon Line and having a large slave population -- 87,189 according to the 1860 census. We're accustomed to thinking in terms of "states," for obvious reasons, but thinking on that scale doesn't allow an accurate picture on the level of communities, families, individuals. It's possible to speak in broad terms of four regions in Maryland, which renders its behavior more comprehensible. 1. Southern Maryland, the nucleus of the colony, founded as a refuge for English Catholics (the counties are mostly named for saints) was, in 1860, a declining region of slave-labor-reliant tobacco plantations with a stagnant economy and a drooping population. 2. The Eastern Shore (birthplace of Frederick Douglass and Harriet Tubman) was so isolated from the rest of the state that it sometimes talked of breaking off and uniting with Delaware. The convoluted coastline of that drowned river valley made a natural haven for smuggling and bred a generally defiant sort of local culture. It had been settled upward from the mouth of the bay in the 17th century, and was united by ethnic and economic ties with Tidewater Virginia. The number of slaves there had been declining, as the economy diversified from tobacco into fruit-growing, and the free black population was large and economically important. Legislative attempts to restrict the economic freedom of blacks in Maryland were thwarted by slave-owning Eastern Shore men, who knew the importance of black freemen to their region. I should mention that my ancestors were among the Eastern Shore slaveowners who set their chattels free in the period 1790-1840, though the results were not happy. 3. The western end of the state, the Catoctin Mountain valleys and rolling farmland, had been settled by people who had arrived there through Pennsylvania, largely of German ancestry, and it retains its cultural affinity to the North. There were few slaves here. 4. In the middle of it all was Baltimore, which was the fourth largest city in America in 1860 (behind New York and Brooklyn, which were separate entities then, and Philadelphia) with 212,418 inhabitants. Its industry surpassed that of any other Southern city. Its port shipped coal from the western counties and textiles from the city's mills as well as tobacco and grain. A visitor who had arrived in 1860 later recalled that "Baltimore had Northern characteristics of finance and commerce which greatly resembled Philadelphia, New York or Boston, but culturally and socially Baltimore had Southern ties which were most evident." It reminds me of John F. Kennedy's quip about Washington, D.C.: "A city of Southern efficiency and Northern charm." The city in 1860 had 52,000 foreign-born residents -- 28 percent of the total white population. It had been a hotbed of Know-Nothingism in the 1850s. It had 25,000 free blacks as well as 2,218 slaves. For various reasons, Lincoln was not a serious candidate in Maryland in the 1860 election. He got only 1,211 votes statewide, though I don't know whether there was any one county where, as someone has suggested, he got no votes. It is possible, and if there was such a county, Charles is a good candidate. Instead, the contest was between Bell and Breckenridge, or, as it was commonly expressed in the newspapers of the day, "Bell and Union, Breckenridge and Disunion." The discredited state of the Know-Nothing movement in Baltimore seems to have been the deciding factor, however, and it cost Bell (who was not sufficiently distant from it) the Baltimore vote. Breckenridge carried the state, but his margin was less than 1 percent. In the crisis after Lincoln's election and the S.C. secession, Maryland tried to steer a neutral course. Despite widespread Southern sympathy, the state had a "latent unionism," in the words of one historian. It also faced the prospect of being the principal battlefield, if war was to come. It was an off-year for the legislature, and the governor was a wiley character named Thomas H. Hicks, a slaveowner from the Eastern Shore who had at one time or another belonged to every major party in the state. He pursued a policy of "masterly inactivity" in declining to call a special session of the legislature. Between the election and the Sumter attack, state committees called for a convention of border states, actively supported the Crittenden Compromise (which would have restored the Union with a constitutional guarantee of slavery) and sent delegates to the Washington peace conference in February, 1861. On April 19, the first large contingents of Union soldiers (about 2,000) entered Baltimore by train, on their way to protect Washington, D.C. They had to change stations from the Philadelphia, Wilmington, and Baltimore line to the B&O, which entailed marching from President Street to Camden Street, and along the way the 6th Mass. regiment was attacked by a secessionist mob that was a mix of "wharf rats" who would fight anyone, for any reason, and some of the leading citizens of the city. In the gunfight that followed the Massachusetts troop lost 42 killed and wounded and 12 citizens lay dead and scores were injured. That's where the song comes in. James Ryder Randall, a Baltimore native then teaching in Louisiana, read about the incident in the New Orleans "Delta" newspaper, and saw in the list of wounded citizens the name of his old college roommate Francis X. Ward (Georgetown '59), a prominent lawyer who had led the citizens' charge on the regiment. In his indignation, Randall hastily penned a poem about the subjugation of his home state, which was published in a Louisiana newspaper a few days later, soon set to music, and, as "Maryland, My Maryland" became a favorite rallying tune for pro-Southerners in the state. It is rather inflammatory, as a state song (the "Northern scum" line, especially), but I don't find anything particularly racist in it. Perhaps someone else can. And sing thy dauntless slogan song, Maryland! My Maryland! That baffles minions back amain, Maryland! Arise in majesty again, Maryland! My Maryland! The Old Line bugle, fife, and drum, Maryland! George W. Brown, Baltimore's mayor, was a non-partisan reform politician who had run against the corrupt Know-Nothing organization and fought mob rule in the city. He denounced disunion and personally stood at the head of the Northern troops as they marched through the furious crowd of Baltimore on April 19, 1861, risking his life to preserve order. 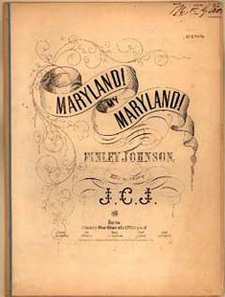 Of Maryland, he wrote after the war: "Her sympathies were divided between the North and the South, with a decided preponderance on the Southern side." Lincoln's proclamation calling for militia after Ft. Sumter was received "in Maryland with mingled feelings in which astonishment, dismay and disapprobation were predominant. 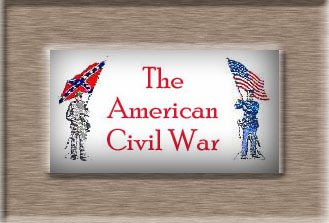 On all sides it was agreed that the result must be war, or a dissolution of the Union, and I may safely say that a large majority of our people preferred the latter." "After the President's proclamation was issued, no doubt a large majority of her people sympathized with the South; but even had that sentiment been far more preponderating, there was an underlying feeling that by a sort of geographical necessity her lot was cast with the North, that the larger and stronger half of the nation would not allow its capital to be quietly disintegrated away by her secession." The men who tried to lead Maryland into secession were not a solid set of die-hard slavery advocates. Slavery in Maryland was a moribund institution. A meeting in favor of secession, held April 18 in Baltimore's Taylor Hall, was chaired by T. Parkin Scott, who "was a strong sympathizer with the South," Brown wrote, "and had the courage of his convictions, but he had been also an opponent of slavery, and I have it from his own lips that years before the war, on a Fourth of July, he had persuaded his mother to liberate all her slaves, although she depended largely on their services for her support. And yet he lived and died a poor man." The federal government felt sufficiently unsure of Maryland's allegiance that it issued an April 27, 1861, order for the arrest and detention of anyone between Washington and Philadelphia who was suspected of subversive deeds or utterances, with its notorious suspension of habeas corpus. This led to the Merryman case, and the Supreme Court's failure to get the authorities to enforce its rejection of the administration's move. Hicks then called the legislature in the northwest part of the state, where unionism was strongest. Though the legislature did not vote to secede, it approved a resolution calling for "the peaceful and immediate recognition of the independence of the Confederate States," which Maryland "hereby gives her cordial consent thereunto, as a member of the Union." The legislature also denounced "the present military occupation of Maryland" as a "flagrant violation of the Constitution." When Roger Brook Taney, U.S. Supreme Court Chief Justice, dared to stand up to Lincoln over the arbitrary imprisonment of Maryland citizens, Lincoln wrote out standing orders for Taney's arrest, although they were never served. But when the Maryland legislature lodged a sharp protest with Congress, Seward ordered a lightning raid across the state that jailed 31 legislators, the marshal of the Baltimore City Police Force and the Board of Police Commissioners, Mayor Brown, a former Maryland governor, members of the House of Delegates from Baltimore City and County, the 4th District congressman, a state senator and newspaper editors (including Francis Scott Key's grandson). Ft. McHenry (of "Star Spangled Banner" fame) had a darker chapter in these days as the "Baltimore Bastille." Many of those arrested by federal officials were never charged with crimes and never received trials. In the fall, Lincoln arrested allegedly disloyal members of the state legislature (Sept. 12-17, 1861), to prevent them from attending a meeting that could have voted on secession. But Maryland was not really safely in the Union until the November state elections. Federal provost marshals stood guard at the polls and arrested known Democrats and any disunionist who attempted to vote. The special three-day furlough granted to Maryland troops in the Union army, so they could go home and vote, further rigged the election. The result, not surprisingly, was a solidly pro-Union legislature. The next year, state judges instructed grand jurors to inquire into the elections, but the judges were arrested and thrown into military prisons. Maryland rewrote its constitution to outlaw slavery in 1864, and put it to popular vote on Oct. 13 of that year. It passed, but just barely, with 30,174 in favor of the change and 29,799 opposed. As for military records, the most reliable figures seem to be 60,000 Maryland men in all branches of the Union military, and 25,000 as an upper limit for Marylanders fighting for the South. Exiles organized a "Maryland Line" for the Confederacy, consisting of one infantry regiment, one infantry battalion, two cavalry battalions and four battalions of artillery. A great many Marylanders, however, were dispersed among other Southern units, especially those of Virginia (Co.H, 7th Va.; Co. B., 9th Va.; Co. G., 13th Va.; Co. B., 21st Va.; Co. E, 30th Va.; Co. E, 44th Va., and so forth). Kevin Conley Ruffner's "Maryland's Blue & Gray" lists 23 Confederate unites, other than the Maryland Line, in which Marylanders fought in significant numbers. There was no official recruiting of Southern regiments in Maryland, of course, and the infrastructure of bounties and relief, so essential in a long war, was unavailable to Maryland men who fought on the side of the South. It may also matter, when considering the enlistment figures, that Union Maryland troops were often raised with the express intention of being kept within the state, as home guards. A sense of unreliability tainted the Northern Maryland regiments. The general in charge of the prison camp at Annapolis wrote to the War Department requesting a regiment for guard duty there, but added that he would "prefer to have [one] from a free state, or at least not a Maryland regiment, which might be likely to sympathize with deserters and affiliate with the people around them." And in 1864 a colonel complained that the Maryland troops guarding the lower Potomac were "too lenient toward blockade runners and secessionists who keep good liquor." 1. It is surprising to me how rarely this is mentioned. I've only seen it twice: in Frederick S. Calhoun's official history, "The Lawmen: United States Marshals and Their Deputies" (Penguin, 1991, pp.102-104) and Harold M. Hyman, "A More Perfect Union: The Impact of the Civil War and Reconstruction on the Constitution" (Knopf, 1973, p.84). Their sources are two different manuscript collections, which makes the claim that much more reliable.